Frozen Fever Party 2016 - Club Penguin Wiki - the free, editable encyclopedia about Club Penguin's games, rooms, items and parties! This article needs to be updated. One or more events have happened, and are not included. 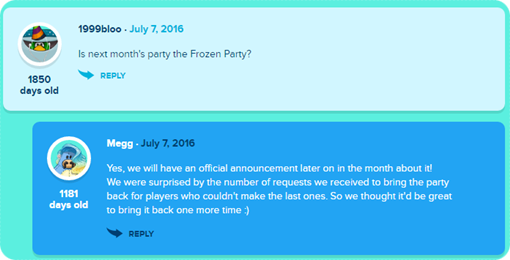 The Frozen Party is a party first confirmed on the What's New Blog by Megg on a comment. It is based on Disney's Frozen. Players can use the Heart emote ( ) to thaw out a frozen decoration. This party had the most free items out of any Club Penguin party until now, beating the previous record-holder, the Star Wars Takeover. It is the third Frozen Party, third sponsored party of 2016, and seventeenth sponsored party overall. Technically, the only differences between this party and the Frozen Fever Party 2015, are the sign saying Puffle Berry Mall at the Plaza, the removal of Elsa's Ice Palace and the addition of Rockhopper as a mascot. It was the last sponsored party to be held in Club Penguin. This page was last modified on 14 July 2017, at 17:24.